The Basilica of Our Lady of the Pillar is perhaps, along with the Cathedral of Santiago de Compostela and La Sagrada Famila, one of the most famous and frequently-visited Catholic cathedrals in all of Spain. According to tradition, it traces its founding back to the era of St. James ve saw an apparition of the Virgin Mary instructing him to build a church on the spot. 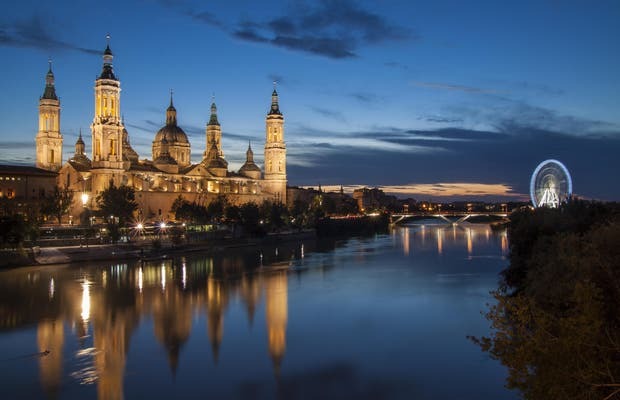 The Cathedral-Basilica of Nuestra Señora del Pilar is in Zaragoza, is the largest baroque religious site in the country, and had a lot of importance in its time. It’s in the middle of the old centre of Zaragoza, and attracts many visitors every year. The cathedral is imposing from the outside, and also the inside. The interior construction, high and very spacious is imposing and at the same time light. According to the myth, the Virgin Mary ordered a small chapel to be built on this site, which later was converted into a church, and into the cathedral-basilica that we see today. There are three naves in the basilica, and various cupolas which give even more height to the building. Most of the city’s archbishops are buried here, along with San Braulio, and General Palafox, who was a famous general in the XIX century, governor of Zaragoza and Captain General of Aragon. As soon as you leave the underground car park in the square, take your camera from your bag. A large granite structure grabs your attention and everybody takes photographs of it. Water flows slowly until it finds a gap where it makes little waterfalls. Up to now, everything normal, but what’s the reason for the shape of the gap? Is it a whim of the designer? Moreover, the water flowing towards the square is contained in a tank as irregular as the gap. You think it doesn’t have an explanation. And after visiting the cathedral you ascend in the lift to the Tower of Santiago and take photos.